See here how to join the further development of RISCAL. 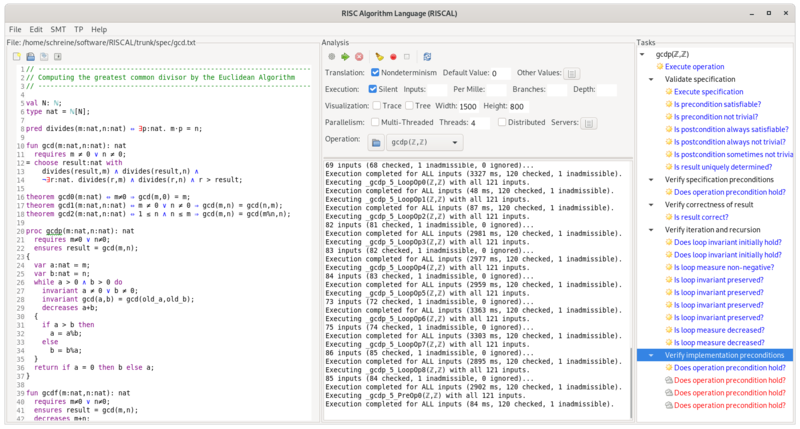 The RISC Algorithm Language (RISCAL) is a specification language and associated software system for describing mathematical algorithms, formally specifying their behavior based on mathematical theories, and validating the correctness of algorithms, specifications, and theories by execution/evaluation. The software has been implemented in Java; it is freely available under the terms of the GNU GPL. Take a look at this video presentation and this paper. To start the software, login as user "guest" with password "guest", double-click the "Terminal" icon, then execute "RISCAL &". The installation of the software with sample specifications is available in "/software/RISCAL". This includes all the files for running the software on GNU/Linux x86 computers (32-bit or 64-bit); for others, the appropriate version of the Standard Widget Toolkit (SWT) has to be downloaded and installed. See the files README, CHANGES, and COPYING. This is the user documentation of the software. 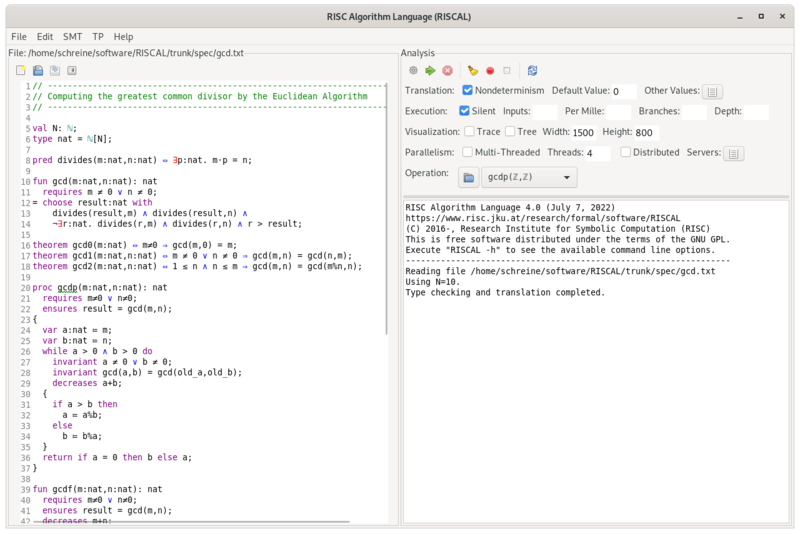 A software to produce web exercises for RISCAL. A slide-based video presentation on RISCAL. Publications and reports on RISCAL. Further slide presentations on RISCAL.